Griffin Park is the home football ground of Brentford F.C. Located within the the city of Brentford which technically falls under the London Borough of Hounslow, the 12,300 capacity venue is famous for being the only English stadium to have a pub on each corner. Griffin Park officially opened on 1st September 1904 when Brentford took on Plymouth Argyle in a Western League fixture which attracted 5,000 supporters. Prior this Griffin Park had held a handful of trial games as The Bees looked to test the new facilities. 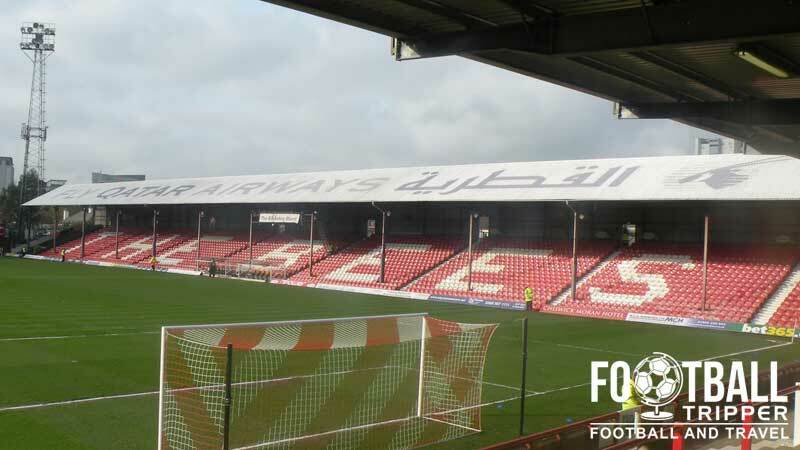 Similar to London Neighbours Fulham and QPR, Brentford lead a nomadic existence in its formative yeas, playing at no less than five grounds before finding a permanent home. The ground’s name is derived from the nearby pub, The Griffin, which was used as an outlet for the nearby Griffin Brewery. In the early days of Brentford’s new stadium it simple consisted of an ash covered pitch and some banks of earth with the pub used as the team’s dressing rooms and accommodation. 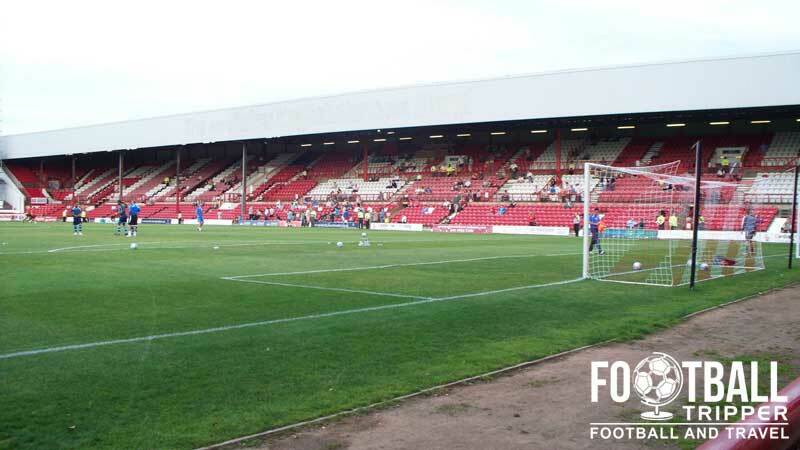 It wasn’t until Brentford entered the football league in the 1920/1921 season that Griffin Park began to develop into traditional football stadium. Brentford’s stadium began to develop in-line with other grounds of the era, although plans were slightly set back due to The Second World War after Griffin sustained bomb damage. The 1929/1930 season saw the stadium dubbed “Fortress Griffin Park” after The Bees won all of their 21 home games – a record which still stands today, and in 1954 the club became one of the early adopters of floodlights. Today the modern era Griffin Park is characterised by its old-school feel and relatively small size for a team in the second tier of English football. Although most stands were converted to seating after the publication of the Taylor Report, the club fell outside of the newly introduced legislation due to being in the lower leagues and thus even today one section of terracing remains. Planning permission for a brand new stadium was granted to the club on Friday 14th March 2014. Dubbed Brentford Community Stadium, The Bees are planning to migrate to a new site on Lionel Road in Kew Bridge. Anticipated for the 2016/2017 season, the new ground will reportedly have minimum capacity of 20,000. 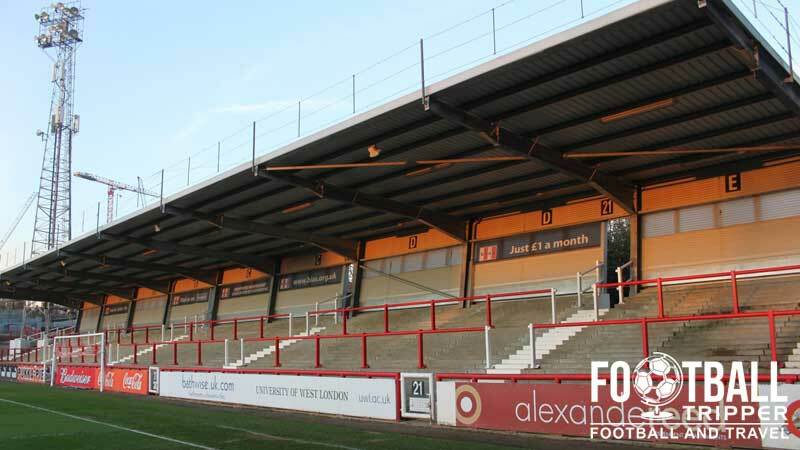 Griffin Park is comprised of the following four sections: The Bill Axbey Stand (North), The Ealing Road Terrace (East), The Braemar Road Stand (South), The Brook Road Stand (West). 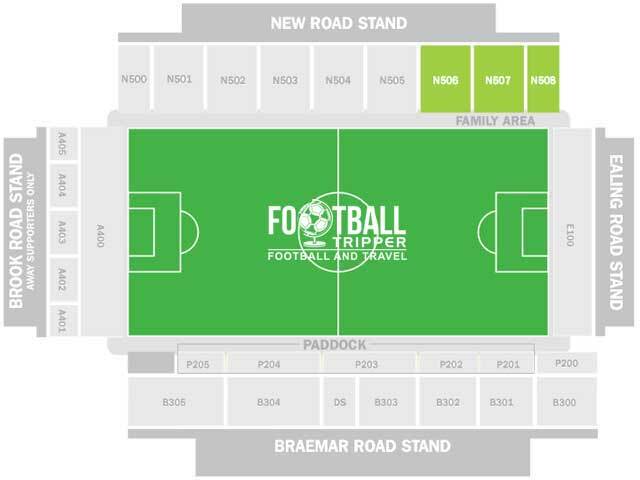 Visiting supporters are allocated seats within the Brook Road Stand which lies at the westernmost point of the ground behind one of the goals. Consisting of two-tiers with a total capacity of 1,600, the ground tier is fully terraced with room for 1,000 fans and the top-tier seats 600 fans in what is actually a pretty good idea for teams in the lower divisions who want the best of both worlds. The Brook Road End is a unique sight in that it doesn’t completely stretch the width of the pitch, and it has a distinctive boxy appearance. Not the biggest structure to begin with, the addition of the second tier from a technical point of view an inefficient use of space, and the roofs on both levels almost appear to be too low from the opposite end of the pitch but this only adds to its charm. The terrace places below also sadly do not offer the best views of the pitch due to the two visible support beams, although the atmosphere on matchday, and friendliness of the club and its supporters more than makes up for any perceived physical limitations. As you’ve probably heard Brentford’s ground is famous for having a pub on each corner of the ground, and visiting all four remains a pre-match pilgrimage for a lot of fans, both home and away. The stadium is built on the site of a former brewery, and it inherits its name from the company, hence why it is called Griffin Park. Starting with the pub closest to the station is The Royal Oak located in the north-west corner, and then proceeding clockwise down, is The New Inn, The Princess Royal and The Griffin. They all have their own character, with the New Inn, complete with Beer garden, regarded as the best standalone pub for away supporters. It’s also worth mentioning that if you have more time to spare, along Brentford Highstreet there is also a lot of decent pubs which serve real-ale as well close to the River Brent such as the Magpie and Crown, and the The Brewery Tap which is a Victorian Pub overlooking the water. Upon visiting Griffin Park from the Brentford Station you essentially have two choices. You can either follow the A3002 south to the high-street which has a reasonable amount of independent takeaways, or head to the ground and follow Ealing Road south where there is a nucleus of takeaways including a McDonalds. Midweek Matches: 10.00 am – 7.45 pm and then for 30 minutes after the full time whistle. Saturday Matchdays: 12.00 pm – 3.00 pm and then for 45 minutes after the full time whistle. The Bee’s superstore. A hive of activity on matchdays. It doesn’t appear as if Brentford FC currently offer fans the chance to undertake a stadium tour of Griffin Park. If this changes, we’ll be sure to update this section. 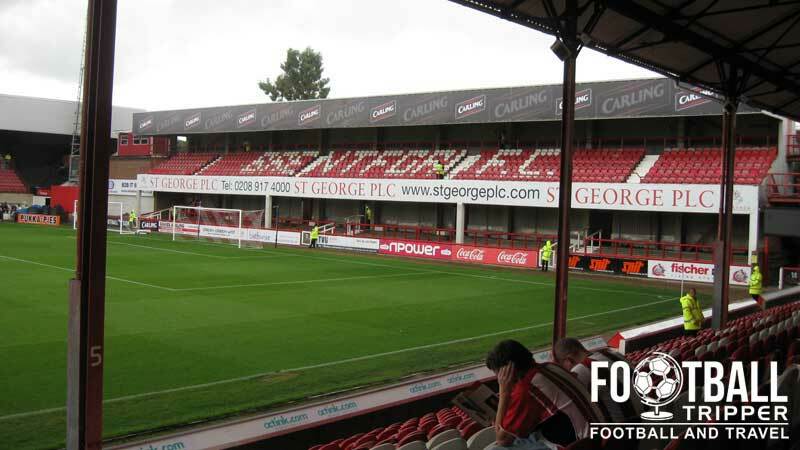 To purchase tickets to see Brentford the easiest way is probably via the club’s online ticket office as you can select your seat using the interactive map and easily compare prices. The official website lacks information regarding ticket purchases offline in person and via telephone, and the booking system makes it very difficult to understand different pricing categories. As a result we can only show you an illustrative pricing example. The below ticket prices are taken from a the match against Norwich and are all based on a single adult ticket. Brook Road (Away fans): Unknown. Brentford’s Griffin Park is located in the West London Borough of Hounslow which is around 7-8 miles from the centre of London with the stadium residing in a primarily residential area. The nearest railway station to the stadium is Brentford with a distance of exactly 0.4 miles by foot which will take the average fan well under 10 minutes. Upon exiting the station tun left and follow the pedestrianised area to Windmill Road where you should turn right. Follow this for a few hundred yards and then turn left on Hamilton Road which will lead you to new Road which is where Griffin Park is located. As with all train journeys in England’s capital you will likely arrive into the city at a different station. From London Waterloo and Vauxhall there is an overground service to Brentford which usually takes around half an hour, with a service from Reading taking approximately 1 hour and 10 minutes. The nearest tube station is either South Ealing on the Piccadilly Line (Dark Blue) or Gunnersbury on the district line (Green). Personally I would get on the Piccadilly Line as I find it seems to be more frequent and has less stops, although this will depend on where you are coming from. Piccadilly also has the advantage of being linked to King’s Cross St. Pancras which operates a wide range of national rail services. Not to mention the resulting journey from the tube station is pretty much a straight line southwards which makes it exceptionally easy – follow South Ealing Road, cross the M4 roundabout as the road becomes just Ealing Road and then turn right onto either New Road or Braemer Road depending on where your seat is located. According to Brentford FC’s website the following bus routes can be used to get to the stadium with the closest stop to the ground, “Brentford, New Road, Stop BS/BC”, located on Ealing Road which is adjacent to the eastern stand of the stadium. Braemar Road, Brentford, Greater London, TW8 0NT. Brentford fans watching a match. Located in Greater London you should be unsurprised to find out that there is no purpose built car park at the stadium for fans on matchdays, with street parking also exceptionally limited. Brentford FC recommend either parking at Brentford Station, Brentford Health Centre opposite the station on Boston Manor Road or lastly on Somerset Road. The closest two hotels to Griffin Park are the omnipresent Premier Inn London Kew Hotel and Travelodge London Kew Bridge which are located on the northern bank of the River Thames along the high street road opposite the Royal Botanic Gardens, Kew. As this is London and the tube is less than a mile away don’t feel as if you have to limit yourself to these areas – if you are planning on making a weekend of it, I doubt you want to stay in Brentford anyway!